As the case is with many things in life, when it comes to loudspeakers, size matters. There's no way around this without breaking the laws of physics. That's why smartphone speakers can't match the performance of a dedicated audio system – they're just too tiny to deliver full, high-fidelity sound. Still, some smartphones do sound better than others. The Galaxy S9 and recent iPhones, for example, use two speakers in clever arrangements to cover a broader range of the audio spectrum and deliver some stereo separation along the way. The Sony Xperia XZ2 and the Razer Phone use two dedicated, front-firing speakers for proper stereophonic, balanced sound. And the new LG G7, well... it has a few audio tricks of its own. Unlike most high-end competitors, the LG G7 has just a single down-firing loudspeaker. Going with a stereo setup similar to the iPhone's would have required a larger notch, LG says. This single speaker, however, gets seriously loud. And it is not only louder than the LG G6. As if by magic, the G7 sounds even louder when it is placed on a flat surface, such as a desk or a table. How did LG achieve this effect? It all starts with a larger speaker driver – the actual physical component that moves air to create sound. It is 40% larger than the G6's and is driven by a more powerful amplifier, while its performance is monitored and fine-tuned by dedicated circuitry to prevent distortion. On top of that, LG uses all of the available internal volume of the G7 to create a sealed enclosure for the speaker. There's a whole science behind designing a speaker cabinet, as audiophiles know well, and its size greatly affects sound reproduction. Case in point: the LG G7 can reproduce lower frequencies about twice as loudly as the LG G6 thanks to having a speaker enclosure 17 times larger. For the record, the G7 is not the first phone to take this approach. Last year's HTC U11 also uses the handset's internal volume as an enclosure for its bottom-firing speaker. So, how does the magic happen? Why does a speaker driver plus empty space equal louder sound? Well, here's the most simplified version I could come up with: think of a classic guitar. The purpose of its hollow body is to amplify the sound from the strings through a process called resonance. 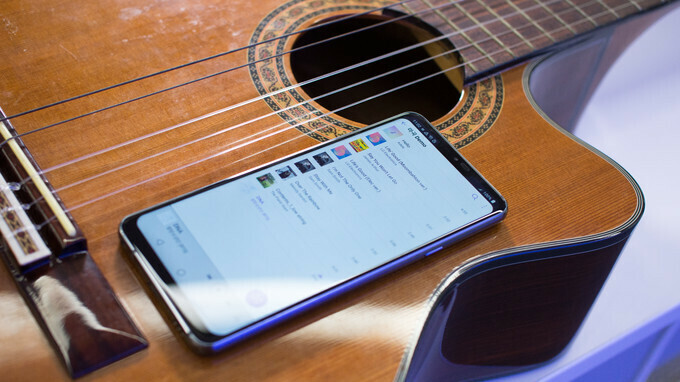 In a similar fashion but on a smaller scale, the LG G7's internal volume acts as a resonance chamber to amplify certain frequencies, mostly bass and mid-tones. That's great and all, but we haven't yet explained why the G7's speaker gets along with flat surfaces so well. The boost in loudness is a result of the fact that the entire phone vibrates because of its unusual resonance chamber design. In a sense, the entire handset is a speaker! These vibrations are transferred to and picked up by the flat surface. Hence, the sound produced by the G7 isn't amplified. Rather, sound energy is more effectively transferred to the air, and via the air to your ears. As I was working on my LG G7 preview, I had the chance to personally test the Boombox speaker in my hotel room. Frankly, there are some impressive qualities about it, loudness being one of them, but there are cases where the G7 doesn't sound quite... right. Sure, it is loud, but when I played a couple of YouTube videos on it – not necessarily music videos – and held the phone in my hand, sound just wasn't as enjoyable to my ears as from a Galaxy S9, which sounds more balanced with its stereo setup. Another drawback of the G7's Boombox effect is that protective cases, depending on the material used, may affect its performance. But then again, the G7's Boombox speaker is a neat feature that I can see a lot of people appreciating. You'll be able to test it for yourself once the G7 is released in the coming weeks. Actually it's louder sound through smaller battery...how do you think they create those empty cavities inside the phone ? Who listens to music without headphones anyway? I do when I take shower. My phone is loud enough to allow me to listen, shower's noise is not an issue. I also only use earphones when someone's around, because I think listen to stuff without near someone is lack of respect. I do when I am running. It's convenient!! Mono is a no no in 2018. Smart use of hardware LG! They crafted the G7 with care. Might be a great feature....... too bad won't be available in all regions like every other LG phone ever released.